Find device-specific support and online tools for your LG G Pad 10.1 LTE. Learn tips and shortcuts to make your LG G Pad™ 10.1 LTE your own. Multi-user allows you to create separate accounts for different users on your LG G Pad™ 10.1 LTE. Watch the steps to add and delete user accounts. Learn how to turn your LG G Pad 10.1 LTE on and off. Improve battery performance on your LG G Pad™ 10.1 LTE. Learn to connect to other Bluetooth® enabled devices on your LG G Pad™ 10.1 LTE. Learn how to pair your LG G Pad 10.1 LTE with your Bluetooth device. Learn how to take a picture of the screen and view it on your LG G Pad 10.1 LTE. Learn how to record a video using your LG G Pad 10.1 LTE. Learn how to take a picture using your LG G Pad 10.1 LTE. Learn how to zoom in and out for taking photos on your LG G Pad 10.1 LTE. Learn how to zoom in and out for video recording on your LG G Pad 10.1 LTE. Discover how to assign a picture to a contact on your LG G Pad 10.1 LTE. Learn how to share the information for one of your contacts with someone else using your LG G Pad 10.1 LTE. Learn where to find the SIM card and tablet numbers for your LG G Pad™ 10.1 LTE. An interactive guide for setting your LG G Pad 10.1 LTE to Airplane mode. Learn how to forward an email on your LG G Pad 10.1 LTE. Learn how to add an attachment, like a document or photo, to an email with your LG G Pad 10.1 LTE. A visual guide for replying to an email on your LG G Pad 10.1 LTE. A step-by-step visual guide for sending an email using your LG G Pad 10.1 LTE. Learn how to access different email accounts on your LG G Pad 10.1 LTE. An interactive guide on how to remove widgets and apps from the Home screen of your LG G Pad 10.1 LTE. 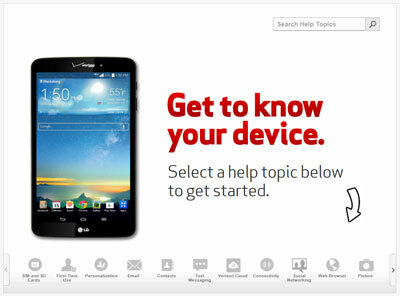 See how to set up the Mobile Hotspot on your LG G Pad™ 10.1 LTE. Browse the web on your LG G Pad™ 10.1 LTE. An interactive guide for changing the language settings on your LG G Pad 10.1 LTE. A visual guide for setting screen security on your LG G Pad 10.1 LTE to help protect your private information. Learn how to remove a microSD card from your LG G Pad 10.1 LTE. Discover how to insert a micro SIM card into your LG G Pad 10.1 LTE. Learn how to remove a micro SIM card from your LG G Pad 10.1 LTE. Learn how to use Q Pair to receive call and message notifications from your phone on your LG G Pad™ 10.1 LTE. Take a picture and write on it with the Quick Memo + app on your LG G Pad™ 10.1 LTE. Send multimedia files from your tablet to other devices with Smart Share on your LG G Pad™ 10.1 LTE. Discover how to change the background of the Home screen on your LG G Pad 10.1 LTE. Learn to set up Wi-Fi on your LG G Pad™ 10.1 LTE. Use Wi-Fi Direct to easily connect via Wi-Fi to other devices on your LG G Pad™ 10.1 LTE.